Before you begin, be sure to understand when you need to report when you have ESPP. You report when you sell the shares. If you only bought shares under ESPP but you didn’t sell during the tax year, there’s nothing to report yet. Wait until you sell, but write down the full per-share price (before the discount) when you bought. If you have multiple lots, write down for each lot the purchase date, the closing price on the grant date and on the purchase date, and the number of shares you bought. This information is very important when you sell. You bought 1,000 shares on 9/30/2014. The closing price on the purchase date was $10/share. The closing price on the grant date was also $10/share. You bought at $8.50/share with the discount. When you sell, you will receive a 1099-B from the broker in the following year. You will report your gain or loss using this 1099-B and the information you accumulated for each purchase. You sold 1,000 shares from your purchase above on 10/5/2014 at $9.95 per share. After commission and fees, you netted $9,900. In 2015, you received a 1099-B from your broker showing a sales proceed of $9,900. The 1099-B shows the cost basis as $8,500, which reflects your discounted purchase price. Because you didn’t hold it for two years after the grant date and one year after the purchase date, your sale was a “disqualifying disposition.” The discount is added as income to your W-2. This raises your cost basis. If you just accept the 1099-B as-is, you will be double-taxed! Now let’s account for it in TaxACT. I’m using the desktop version. Online interface may look different. Click on Federal Q&A. Expand Investment Income -> Gain or loss on the sale of investments. Click on Capital gain or loss (Form 1099-B). Click on the Add button to add a new 1099-B. Enter the description and purchase and sale dates. 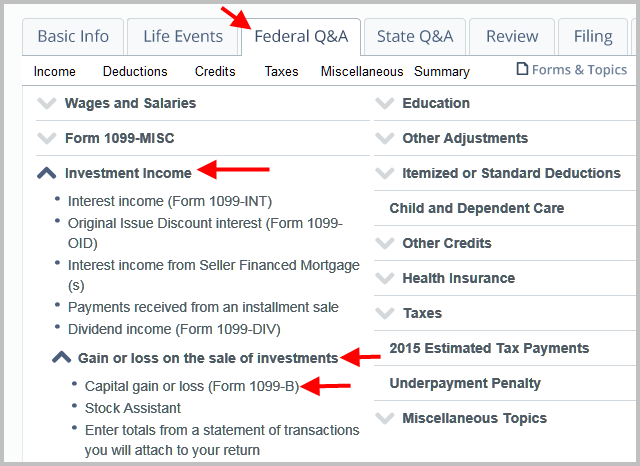 Find the reporting category on your 1099-B. For our example it’s A. Enter the proceed and cost basis from the 1099-B. Don’t change the numbers here. You will do the adjustment later. From this point onward, you can choose one of two paths: enter a manual adjustment or use the ESPP wizard. I will first show the manual adjustment. Select adjustment code B for incorrect cost basis. Here you will have to do some math. The market price was $10/share when these 1,000 shares were purchased. Your employer added the discount as income to your W-2. Therefore your true basis was $10 * 1,000 shares = $10,000. If you didn’t sell all the shares purchased in that lot, multiply the number of shares you sold by $10. The basis reported on the 1099-B was $8,500. The reported basis was too low by $10,000 – $8,500 = $1,500. Therefore you enter the adjustment as a negative number: -1,500. Select yes or no depending on whether there was tax withholding. Typically there is no tax withholding. Because we already did our adjustment, we don’t need to go into ESPP again. Select None of the above. You get a mini-alert, but don’t be scared. Click on Now. It wants to double-check that your adjustment is correct. Check the box to confirm. From the previous junction, you can also choose to use the ESPP wizard. It’s not any easier than manual adjustment. I think it’s actually more difficult. Don’t select any adjustment code. Click on Yes. The discount was already included on the W-2. It tells you to enter adjustment code B but it doesn’t tell you the adjustment amount should be a negative number if your true basis is higher than reported. Whether you choose manual adjustment or the ESPP wizard, you arrive at the same place. You are done with this one lot. It shows that you actually lost $100 from the sale because you sold at $9.95/share, which was slightly lower than the $10/share market price on the purchase date, and you had to pay commission and fees. Click on Add and go through the whole thing again for another sale. If you didn’t do the adjustment and you just accepted the 1099-B as-is, you would pay capital gains tax again on the $1,500 discount you already paid taxes on through your W-2. Remember to do the adjustment! You have no idea how much this helped validate my understanding of the new 1099B reporting…. and correlate to TaxACT. It is hard to find examples from TaxACT ( most forums are talking turbo tax) . This is a huge timely help! thanks! Thank you very much, this was *extremely* helpful. I agree. It’s extremely helpful and saved us money. Harry, how to find out how much money did I save by adjusting the cost basis? Sam – You look at the tax refund or tax owed before and after the adjustment. I’m inputting data exactly as you posted. After I do this, capital gain adjustment is shown in Q/A section; However Form 8949 numbers are not changing at all as well as the amount of tax I owe! 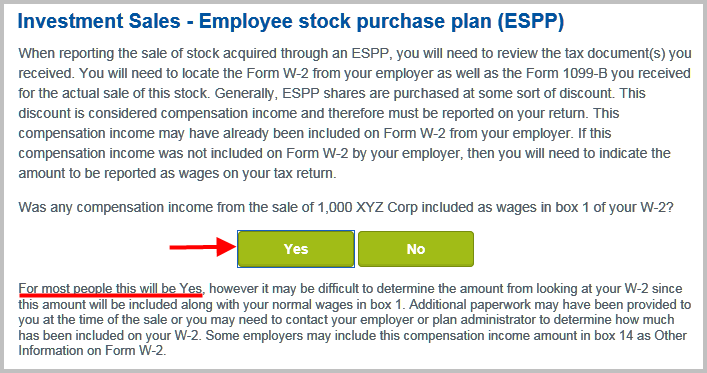 My sale was a qualified disposition and the ex-employer did not report the discount on a W-2 since I have left the company long ago, do I still need to adjust the cost basis? Thank you very much! Very helpful! I would have double-taxed myself if it wasn’t for your article! Your blog has been extremely helpful for me during tax time. I have a question – I know tax season is way over, but I wanted to see if I’m correct on something. I did my taxes a little differently between disqualifying vs. qualifying dispositions. My question is on the qualifying. Box d has proceeds of $1200. Box e has cost/basis of $500. Box f has “B” code. Box g has adjustment amount of ($100). Box h has a total gain of $600. Is this correct in that the W2 income of $100 should be the amount of adjustment (as a reduction)? It just threw me off I initially calculated this stock sale in the same manner as disqualifying dispositions, but something appeared off. My CPA had also glazed over my taxes and didn’t say anything about it looking incorrect. I redid it with the scenario shown above and believe this is the correct way. That’s correct. The amount included on your W-2 was $100. You enter it as a negative number as an adjustment.